San Jose, 9 November 2018 (IICA). Together with the Food and Agriculture Organization of the United Nations (FAO), the Inter-American Institute for Cooperation on Agriculture (IICA) assisted the Caribbean Network of Rural Women Producers in analyzing the demand for their products as well as value-adding opportunities, in order to broaden their access to Caribbean markets and increase their competitiveness. The initiative was held in Barbados as one of the activities of the Caribbean Week of Agriculture and benefited women from Antigua and Barbuda, Bahamas, Jamaica, Guyana, Saint Vincent and the Grenadines, and Trinidad and Tobago who are engaged in the production of a range of food products and handicraft. To strengthen the women’s trade capacities, IICA facilitated their participation in the trade exhibition hosted as part of the Caribbean Week of Agriculture 2018. IICA also undertook a market study tour with the ladies that allowed them to build capacity in their marketing effort. 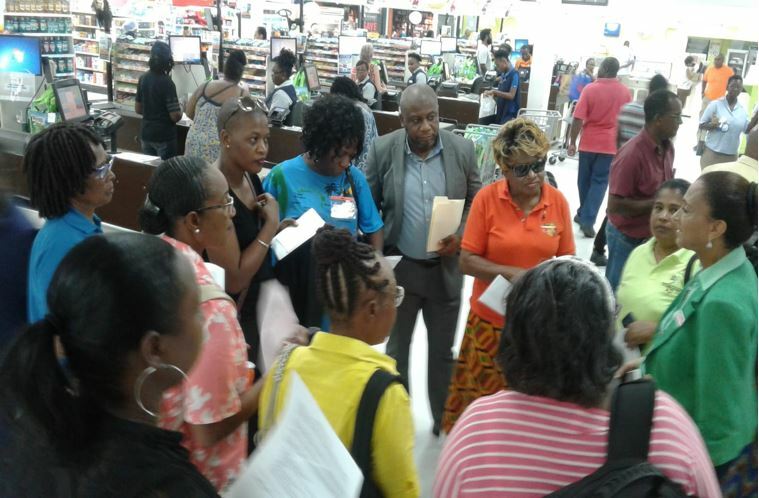 At a major Regional supermarket chain located in Barbados, the women were instructed them on ways to improve the quality of their products through packaging standards, pricing criteria and innovation to expand the number of product options available to consumers. The Institute also organized a roundtable discussion with private-sector specialists in order to analyze opportunities to access different markets. Tamisha Lee, President of the Jamaica Network of Rural Women Producers, highlighted the significance of the experiences and information afforded by the specialized agency of the Inter-American System for agriculture. “Now is the time to implement programs aimed at capitalizing on opportunities available for intraregional trade,” she stated. As part of the training session, Wavel Fraser, General Manager of the Massy Stores supermarket chain, met with the businesswomen to assess the competitive environment for their products. As such the women benefitted from a roundtable discussion in order to analyze opportunities to access overseas markets. On seeing some of the products by the women. Fraser noted that the products have the potential for intraregional trade, and to be sold in the company’s various stores. “This exercise has proven very useful in boosting our confidence with respect to our product offerings and marketing opportunities at the regional and local levels,” stated Daphne Cato, President of the Network in Saint Vincent and the Grenadines.